Indoor potted houseplants not only look gorgeous and brighten up a home, but they can also be beneficial to our mental and physical health. How? They essentially do the opposite of what we do when we breathe: release oxygen and absorb carbon dioxide. This not only freshens up the air, but also eliminates harmful toxins. Studies have also proven that indoor plants improve concentration and productivity and reduce stress levels. Indoor potted plants are known for producing oxygen. They absorb the carbon dioxide that we exhale and release oxygen during photosynthesis. Keeping plants indoors at home will provide you a natural filter of the dry air and dust that circulate inside your home. Some of the plants that can effectively remove harmful toxins include snake plant, spider plant and golden pothos. Plants can also raise the air’s humidity by releasing water as moisture vapor – this can protect us from getting respiratory problems, dry coughs and sore throast. Flowering houseplants can help decrease our stress levels, which is becoming increasingly valuable as our lives get busier. Look for mini herb gardens or bonsai trees and place them on top of your desk or in the corner of a room in your home. 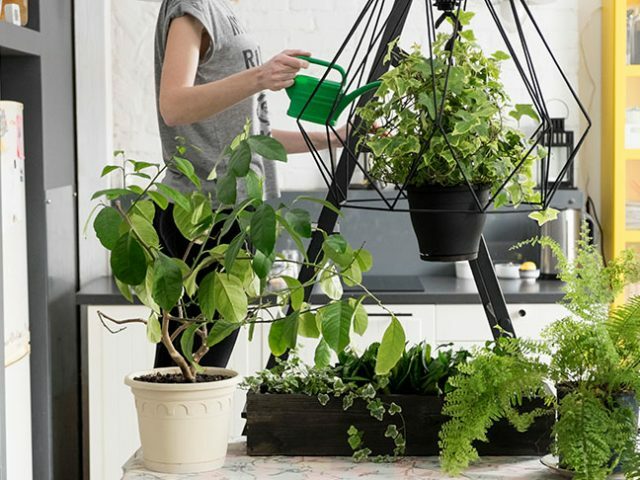 Potted plants can block harmful toxins and diffract background noise levels, and according to a recent study, living and interacting (like touching and smelling) can reduce both physiological and psychological stress. Studies have shown that keeping plants in your living quarters, or even in your office, help you keep a more positive outlook by reducing stress and fatigue and enhancing productivity. Plants help to increase our levels of positivity and make us feel more secure and relaxed. They can also help with loneliness and depression. Caring for a living thing gives us a purpose and is rewarding, especially when a plant you have been lovingly caring for starts to blossom. In one study, it was found that people who keep houseplants experience an increase in empathy and improved relationships. They are also good antidotes for people with failing memory or individuals who have dementia. In fact, horticulture therapy is advisable for hospital patients and people exposed to stressful working environments. Do you have trouble sleeping at night? Your houseplants can help out with that. Studies have shown that the vapor from some plants, specifically lavender and jasmine can lead to a more restful sleep. Keep a lavender or jasmine plant by your bed. The smell from these plants induces a state of tranquility that will help you achiever a good night’s sleep. So, with the cleaner air, increased oxygen levels (see above), plants aid in a better night sleep, and really, who couldn’t benefit from that? Some well-placed greenery can not only brighten a space but also purify the air – and they’re also helpful in creating a more relaxing, restful ambiance in any room. How do plants benefit your life?